NYC, 04/17/2019, 6:30AM. Boot Camp. 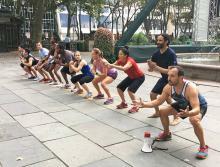 The Rise NYC, a community-driven pop-up fitness group, hosts a Boot Camp. Rotations through exercises like crunches, planks, push-ups, burpees, and mountain climbers ensure a mixture of cardio and strength training that will keep you coming back, and seeing results. No equipment necessary; smiles and high fives encouraged. Rain or shine.